After 20 years apart, Jamie and Claire reunite and try to settle back into life with each other. Watch a sneak peek of this week’s Outlander, “A.Malcolm”! Sassenachs, we’re just a few days away from the episode we’ve been waiting and waiting for. The Jamie/Claire reunion is coming this Sunday in “A. Malcolm”! Last month Executive Producer Matthew B. Roberts sat down with Entertainment Tonight to discusses Jamie and Claire’s journey in Season 3. Roberts actually wrote “A. Malcolm” and promised us that we fans would be rewarded for our patience. My friends, let me assure you that this episode is EVERYTHING we have been wanting. In fact, in my humble opinion, it’s the very best episode of Outlander they’ve ever done, EVER. “A. Malcolm” hits every single emotion and does so perfectly: the shock and disbelief, the questions and confusion, the process of trying to settle into a rhythm with someone you knew 20 years ago and desperately want to know again. It’s romantic, beautiful, awkward, and I LOVE it. Truly, Team Outlander has outdone themselves and I’m so grateful. Remember that the episode is going to be almost 80 minutes long too *EEEEP*. 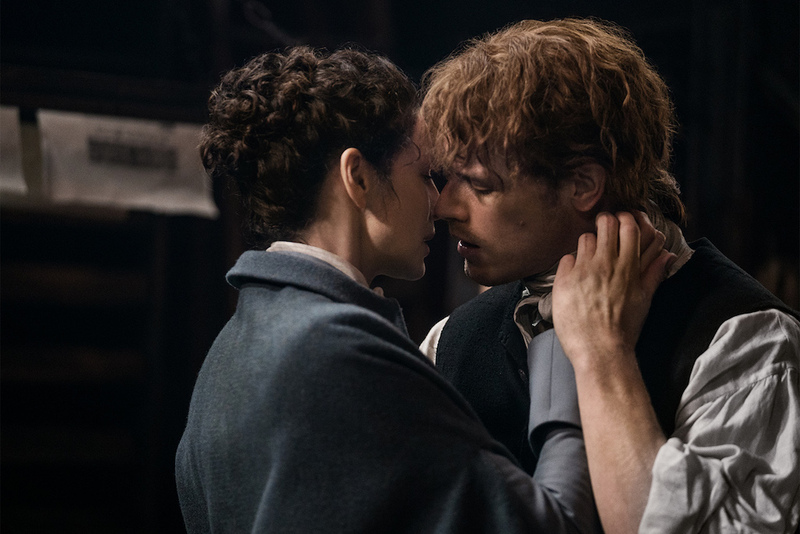 STARZ released new images from Sunday’s episode and we see that Jamie and Claire will be spending lots of time together. Courtesy of Outlander © 2017 Sony Pictures Television Inc. All Rights Reserved. Refresh yourself on the events of “Freedom & Whisky” with our recap and video review; flail with us over our love of Claire and Caitriona (plus buy your t-shirt to support Cait’s Represent.com/World Child Cancer campaign). Then make sure to live tweet “A. Malcolm” with me at 8p/7c this Sunday, October 22 on STARZ!